While browsing down my tumblr, I found a picture that raised my eyebrow, a picture that caused my mind to wonder what the creator of such a remarkable picture was trying to say. My mind interpreted the picture in many different ways. 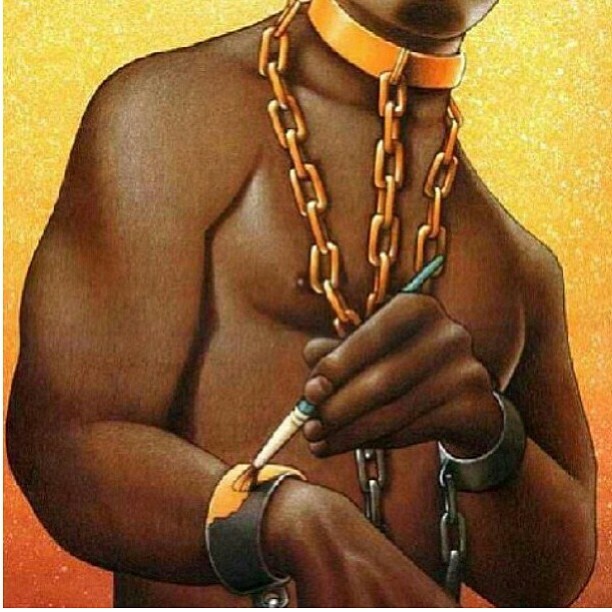 When I first seen the picture I automatically thought the picture meant that African Americans nowadays are still enslaved. The metal collar and chains that are placed upon us and keep us captives are now covered in “gold”. Gold could represent the flashy cars we buy to show our friends that we have a lot of money even though that money could be used to buy other essentials we are lacking at home. Gold could also be the racks of sneakers we have even though we are struggling to make ends meet. Although Caucasians do crave possessions it is as if take pride in ignorance. For example in the song Clique, Kanye West said “You know white people get money don’t spend it or maybe they get money, buy a business, I rather buy 80 gold chains and go ignorant I know Spike Lee gon kill me but let me finish blame it on the pigment, we living no limits them gold Master p ceilings was just a figment of our imagination, MTV cribs” We have to stop trying so hard to impress people we don’t even care about with materialistic things. A friend of mine by the name of Brittany commented on the picture and said “it can be that for so many years, African Americans have been painted in black and white and portrayed in negative light as slaves that we are slowly beginning to paint our own picture. But as you see there is still some grey areas that keep us bound” I totally understand where she is coming from because for so long we let others tell our history. We must take the initiative. We have to learn about the African Diaspora, we must arm our children with the weapons of war. Remember we must fight for what we believe in.